If you know Office Essentials, you know that part of our mission is to help our customers reduce their carbon footprint. Our SmartChoice program is designed to help customers save time, costs and carbon and the process involves us challenging them to rethink everything about their procurement process. The exercise tends to uncover opportunities for companies to save real money while also reducing their carbon footprint. Given that we’re in these discussions every day, I was excited to read Adele Peters’ piece on the Fast Company Exist blog The World’s Largest Purchasers Are Asking Suppliers To Reveal Total Environmental Impact about how the world’s largest companies are analyzing the procurement process to decrease their carbon footprint. With an annual budget of close to $500 billion, when the U.S. Department of Defense changes how it decides what products to buy, manufacturers listen. The department is testing a new system that would require suppliers to report the total environmental effects of each product throughout its lifecycle—from water use in manufacturing to the carbon footprint of how it’s used. It’s one of several major government agencies and corporations that are starting to consider sustainability as part of the “total cost of ownership” of the products they buy. 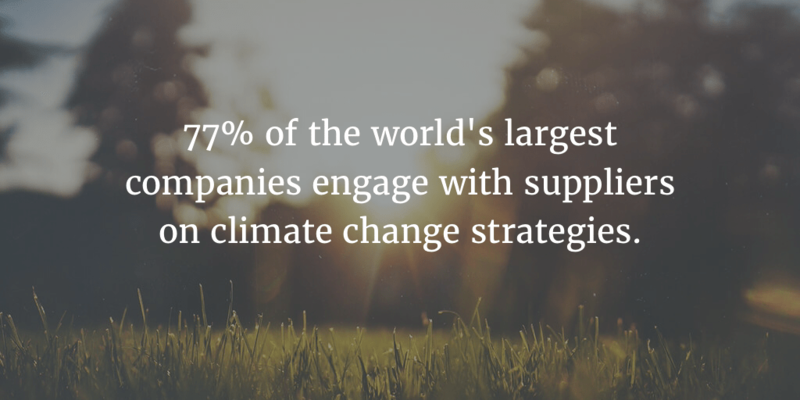 In a new report, the nonprofit CDP reports that 77% of the world’s largest companies now engage with suppliers on climate change strategies.